Wittgenstein doubted the robustness of evolutionary theory, too. And threw a hissy fit when Karl Popper showed him what's what. And didn't believe ethics could even be discussed. He fucked things up. Witt was right about Darwin. The relevant quote, below, is from 1951. "Darwin's theory lacks the necessary multiplicity to explain the diversity of living things." 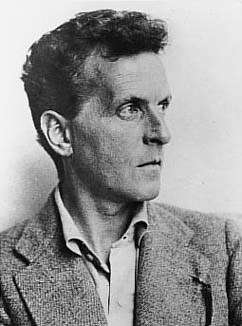 Wittgenstein's criticism of "Darwin's theory" is identical to that of the Great Synthesis (and strangely similar to Karl Popper's misinterpretation of Darwin). Due to his misreading of Darwin, Popper rejected evolutionary theory for 2 decades until he realized that sexual selection was a crucial engine of genetic diversity and that it gave rise to the appearance of "non-utilitarian traits", carried by organisms. To Popper, evolutionary theory required both natural and sexual selection for it to be falsifiable. In his 1932-35 lectures, Witt eerily anticipated Gould's critique of the pan-adaptationist program with his rejection of an (older) crude variety of Evolutionary Psychology. He - literally - evokes the specter of Gould's "spandrels" (neutral traits which piggy-back on adaptive traits). Gould was more right than Witt about Darwin. Darwin never atomized organisms into traits - which all must be seen to show "utility". Gould knew his Darwin. To Darwin, the object of selection is the individual organism - not the trait. "A tendency has come into vogue with the modern sciences to explain certain things by evolution. Darwin seemed to think that an emotion got its importance from one thing only, utility. A baby bares its teeth when angry because its ancestors did so to bite. Your hair stands on end when you are frightened because hair standing on end served some purpose for animals. The charm of this outlook is that it reduces importance to utility." Since no one in the group has a clue about evolutionary biology, it needs to be explained what the objective is. The level of genetic variation and diversity found in nature needs to accounted for - by a coherent theory. Darwin's theory lacks a "mechanism of inheritence". He predicted that it would fail should a new theory come along containing one. After the re-discovery of Mendel's laws in 1901 by de Vries and others, most of Darwin's theory was abandoned by scientists for a short period of time. They surmised that Mendel's laws, as applied to evolution (mutationism), could explain the levels of genetic variation observed in nature, the fossil record, etc. - better than Darwin's did. Many of the geneticists - at the time - rejected Natural Selection (NS) - outright. Ultimately, mutationism failed more spectacularly than Darwin's did. From the 1920s to the 1950s, Darwin's biology and Mendel's laws were formally fused-into what is known as the "Modern theory of evolution". However, even Darwinian biology and Mendelian genetics - combined - do not adequately explain the variation and "the diversity of living things". The great biologist, Th. Dobzhansky, pointed this out clearly. In 1929, Sewall Wright discovered "genetic drift". Until the late 1960s - when it was shown by experiments that it caused "some if not most of the changes in the genetic material", genetic drift was controversial and downplayed. Remove NS, evolutionary theory fails to explain the preservation of "utilitarian" traits - which organisms carry. Excise SS (as Rob L Norton has done), evolutionary theory fails to explain the persistence of "non-utiltarian" (disadvantageous to survival) traits. Rip-out Mendel's "mechanism of inheritence", evolutionary theory fails to explain heredity. Expel genetic drift, evolutionary theory fails to explain the "neutral" (physical and psychological) traits invisible to selection (i.e. Gould's spandrels) - that organisms show. Without NS, SS, Mendelian inheritance and drift, evolutionary theory cannot explain what needs to be explained about what are observerable matters of fact in nature. Darwinian biology + Mendelian genetics + genetic drift do explain "the diversity of living things". Witt was right to dump on Darwin's theory. Biologists did (and still do) identically dump on Darwin's theory. Unlike you drips, dolts and pellet-heads who contaminate this group, sharp minds like Witt, Dobzhansky and Popper do not approach a scientific theory as an article of faith. Nor do they (as Rob L Norton) semantically re-work a crucial driver of evolution (SS) into a deformed, intensionalized absurdity.